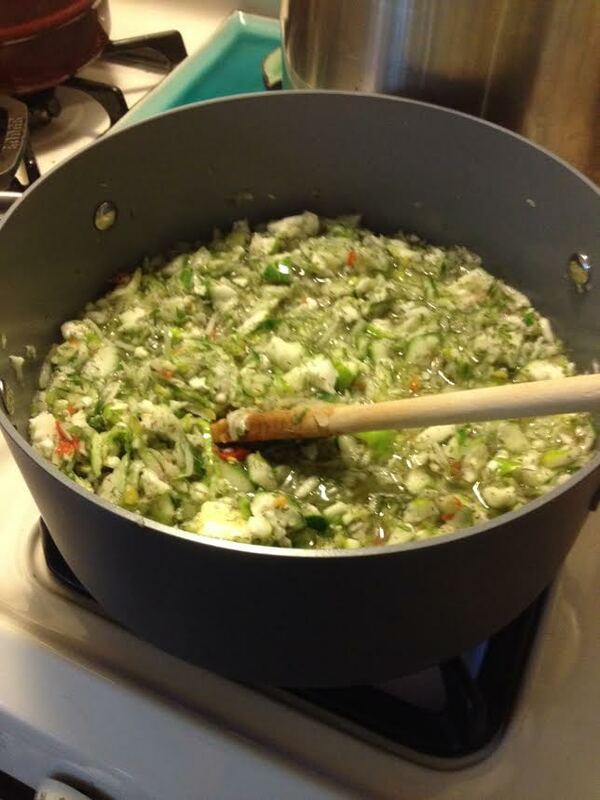 I made sweet dill pickle relish this past weekend, using up the very last of our cucumbers from the garden, all the little guys and misshaped imperfect ones that don’t do much in a salad or as pickles. This was my first time making this recipe, and probably wraps up my canning season for the year. We’re down to tomatoes and banana peppers still coming in from the garden, and have already made more salsa and sauce than we have ever made before. 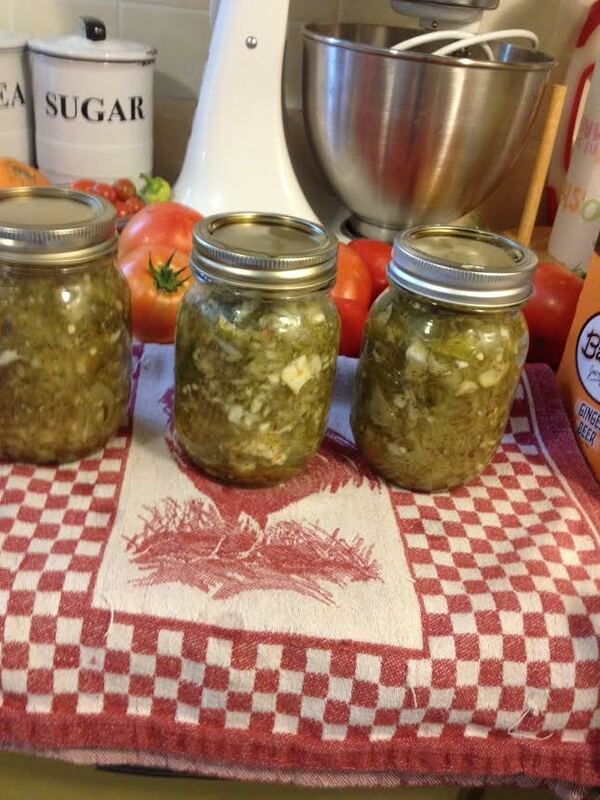 We even made two jars of pickled peppers – another first this year! I found a few recipes online at Pinterest, yes Pinterest again! I wasn’t completely satisfied with either one so I sort of combined them and put my own spin on it too. Both recipes call for about 4 cups of shredded cucumbers, which is A LOT of cucumber shredding, believe me! I thought I’d never finish and it really made my hand hurt. A shredded medium sized yellow onion was next. I added 4 green banana peppers and 1 red banana pepper, also shredded. I would have liked to have had another red one for color, but I think you could also used pimentos if you wanted. Just a dash of red looked nice. 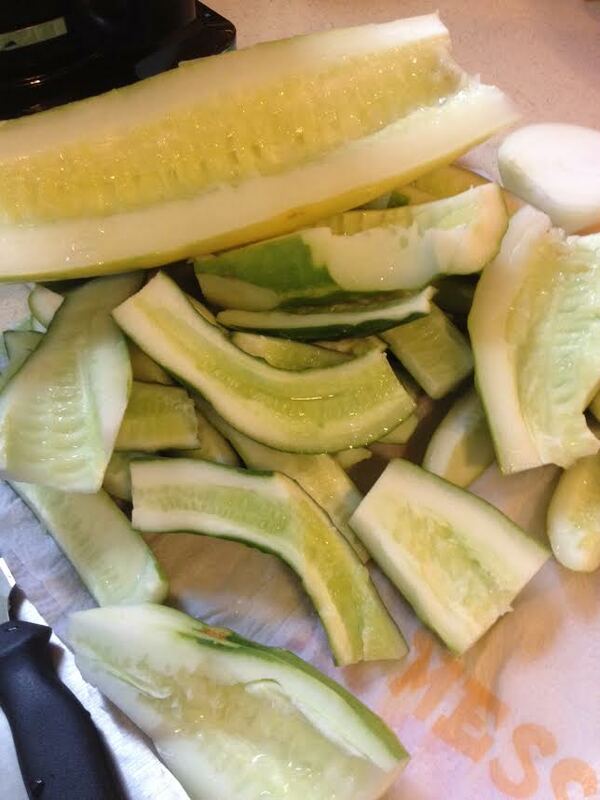 I removed the seeds from the cucumbers by cutting them length-wise and then cutting them again into quarters and scooping out all the gelatinous insides that holds the seeds. I left the seeds in the peppers though. Mix all ingredients, bring to a boil for a few minutes, and then can and process. This made 3 pint jars for me. Besides the peppers, the dill weed, pickle crisp, and pickle mix were my idea. I wanted a bit more spice and also wanted to keep the pickle crispy. It tasted yummy, and I can only imagine how nice it will taste once the flavors have absorbed throughout. We don’t eat a ton of relish, but probably go through 2 or 3 jars a year from tuna fish sandwiches to hot dogs. I even like it on salads sometimes. But it was nice to try a new recipe and use up the leftover cucs. And you can’t beat homemade when it comes to anything! All those odd shaped cucs finally have a purpose! It smelled and looked wonderful. Tasted wonderful too!